Inside Angkor Wat at dusk. It’s pitch black outside but it’s easy to find my way. There’s only one way to go: the same way as the tour buses, vans, and tuk-tuks. It’s before sunrise and we’re headed to Angkor Wat. I arrive by bicycle to the biggest attraction at the Angkor ruins in Cambodia. I had read of people that had seen the sunrise from another ruin so I keep pedaling. After a hundred feet I can’t see my handlebars. I turn back and get a really expensive coffee from the cart out front. We approach the main gate in a large hoard and are met by an army of park attendants armed with flashlights to check our valid tickets. It looks like riot police doing crowd control, when in reality the most dangerous things around are the oversized camera lenses being hoisted in fanny packs. Entering the ruins in the darkness is surreal. I try to imagine I’m apart of a large religious procession – which I am, simply of a different kind than I’m imagining. The area in front of the pond facing the east is already three deep. I linger off to the side and watch people try to jostle for space. As the sun starts to come up, every kind of photographer does their best. Professional Nikons compete with Ipads and camera phones held overhead hoping for the best shot ever. This scene is rather uninspiring. The sun coming up over Angkor Wat is nice. Once the sun is high enough to walk around, I sneak into the ruins to beat the crowds waiting for the glow to peak over the prangs of the temple. Even on my bicycle, I have a good jump on the tour buses for the day, having left my hostel at 5am and arrived at Angkor Wat around 5:30. Before midday I’m at my last destination in the “small loop,” Ta Prom, and the place is mobbed with people taking pictures in front of places that were featured in the movie Tomb Raider. Incredible bas-relief sculpture at Bantei Srei. I’m impressed most by the bas-relief sculpture in the ruins, most notably Bantei Srei – 35 km away from the main hubbub. But I’m also impressed by the shear scale of everything. 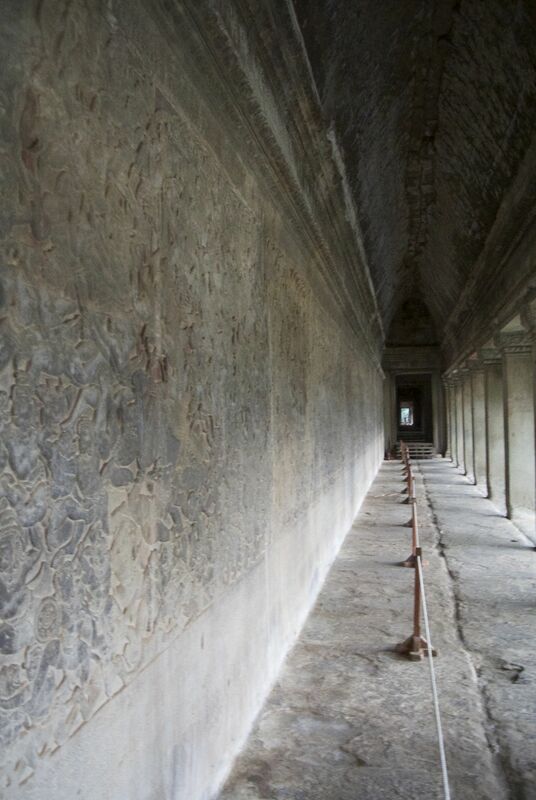 Angkor Wat’s inner temple is ringed by a depiction of the “Ocean of Milk” in Hindu cosmology. I stroll along in the light of dusk enjoying the scene. The “Big Loop” features some of the most massive structures outside of Angkor Wat. A tuk-tuk driver takes me to the gates Prea Khan, the bridge over the moat featuring a line of huge statues anchoring the edges, and picks me up on the other side. At times, it’s hard to decipher the nature of the images, the majority of temples being built under Hindu kings, and some like Preah Khan, built under Mahayana Buddhism. Though the temples feature a jumble of iconography, most temples now accommodate images following Theravada Buddhism – the prevailing religion in present-day Cambodia. Siem Reap, the city adjacent to the ruins of Angkor, is a trip. It is backpacker party central, an economic and touristic center of Cambodia, as well as the gate to the country’s most impressive and iconic legacy. In the morning when I was waking early to see the ruins I would encounter people still awake drinking, their day coming to a close as mine is beginning. It is expensive, the food is good, and opportunism is rampant. At Bantei Srei, at 8am, I’m approached by a police officer that asks if I want to buy a patch like the one on his uniform. These Russians took so many pictures. Gotta have this Tomb Raider pic. There is much more that I could have seen, having spent three days exploring. There are ruins further afoot in every direction. But I’m satisfied with all I’ve seen and exhausted from the variety of input. I leave early in the morning bound for Phnom Penh to experience a very different place and time in Cambodia. This entry was posted on February 4, 2015 by alexjparton. It was filed under Asia, Cambodia, Travel and was tagged with after hours, angkor, angkor wat, asia, bicycles, cambodia, photography, ride bikes, ruins, siem reap, sunrise, tourism, travel.